Dell has announced that later this month they will begin selling their first computer (the OptiPlex 3030 all-in-one) made with plastic recycled from old electronics. With this announcement, Dell is launching its pilot for a closed-loop recycling of plastics – turning plastic from old electronic products into new ones rather than dumping them into the usual e-waste cycle. Dell told ETBC that the move is, in part, in response to increasing requests from purchasers for closed-loop recycling. Closed-loop recycled plastics have been used in ink and toner cartridges for printers, but this is the first time that we are aware of plastics from recycled electronic products going into a large part of the product itself. Manufacturers have also used recycled plastics in enclosures before, but they came from recycled water bottles or CD cases, not from used electronics. While this may not seem like an important distinction, we think it represents a very significant step towards a more sustainable product lifecycle, and an important milestone for the concept of Producer Responsibility. Typically, plastic enclosures from old computers and TVs (which are fairly large pieces of plastic compared to other electronic products) do get recycled. Recyclers send most of these plastics to China where they are “down-cycled” into a lower-grade plastic, used in products like outdoor furniture, or decking material. With a closed-loop system, the plastics from electronics are recycled into new electronics or other products where the plastics are of the same quality. This offsets the use of some amount of virgin content in manufacturing the new electronics. Currently the parts of the OptiPlex made with closed-loop plastic (the back panel and stand) contains 35% recycled ABS plastic, and 65% virgin ABS. Those parts represent only 12% of the plastics (by weight) used in the product but it is an encouraging start. Dell says they hope to increase both the number of parts where they can use the recycled plastic as well as the percent of recycled plastic compared to virgin plastic. They also plan to add the recycled plastics to other desktops and monitors later this year. Several years ago, Dell accepted and embraced the concept of Extended Producer Responsibility (EPR), which says that the manufacturers should be responsible for the full lifecycle of their products, including the “end-o-life” phase, when consumers want to dispose of them. 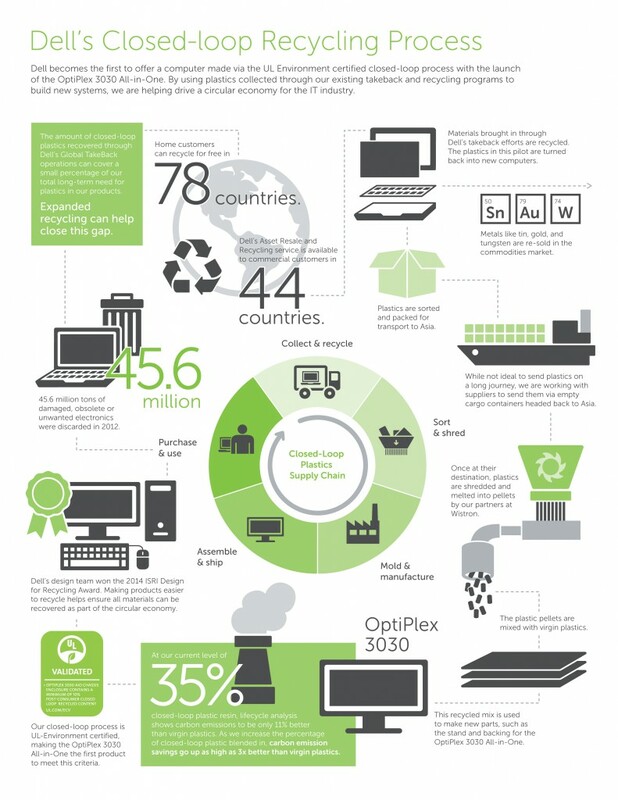 As a result, Dell has developed a fairly robust program throughout the U.S. to take back and recycle its old products, as well as those of other manufacturers. Because Dell manages its own recycling vendors (and doesn’t use a network of recyclers managed by others) they retain control over what happens to the materials – including the plastics – from these products. For this initial pilot, Dell will focus on plastics coming back from its takeback programs in seven states. The plastics will be recycled by Wistron Green Tech, a Texas-based subsidiary of a Wistron Corporation, a Taiwanese original design manufacturer (ODM). Dell’s goal is to use 50 million pounds of closed-loop recycled plastic by 2020. They will focus on two types of plastics: ABS and PC-ABS. The plastics will be recovered both in the U.S. and in China, but even the U.S. processed plastics will be shipped to China for manufacturing into new plastic parts. Scott O’Connell, Dells Director of Environmental Affairs, tells us he expects this closed-loop program to drive U.S. recyclers “to improve recovery rate of plastics by creating an upcycle market that did not previously exist in large scale.” He expects this drive even more plastics recycling as other manufacturers also start to use the closed-loop recycled plastics. Ultimately the goal for closed-loop recycling is to keep using the materials over and over again, maintaining the same grade and value of the material. The sustainability metric here should be to create “infinitely recyclability” where the materials can be used indefinitely, with the addition of very little virgin content. While some metals are infinitely recyclable, the plastics being recycled in this pilot – ABS and PC/ABS – don’t currently meet that goal. But this may be the first step of many towards a system where materials are selected and used with increasing recyclability in mind. If the electronics sector followed Dell’s lead and embraces the closed-loop recycling concept, perhaps we will eventually see the development of plastics that would come closer to being infinitely recyclable. Frankly it’s rare for the electronics manufacturers to even talk about the circular economy, so we are glad to see Dell leading the way in bringing this issue forward. To all the purchasers out there who have been asking about closed-loop recycling or the circular economy in your equipment RFPs and questionnaires, your efforts are paying off, and Dell is clearly listening.